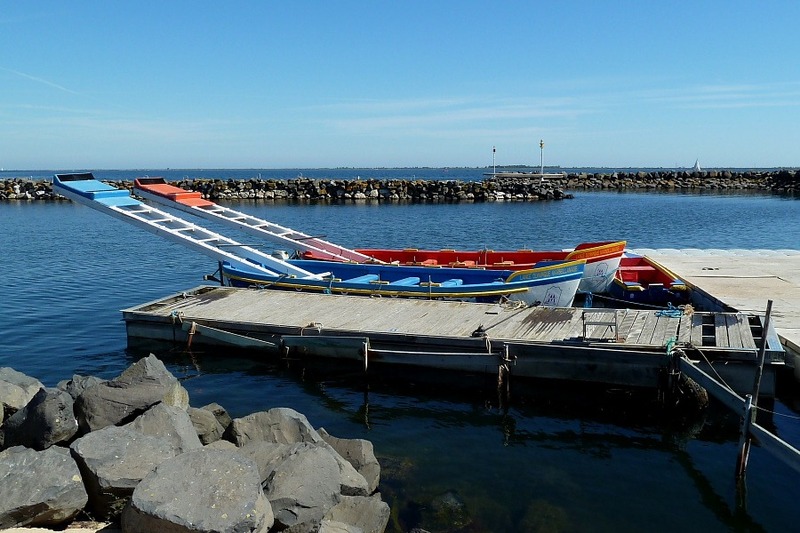 In the local harbours of Marseillan, Mèze and Sète, the attentive wandering tourist may catch sight of some rather curious looking rowing boats. It’s entirely possible that these craft also occur in other harbours further afield but the three towns mentioned, all surrounding the Basin de Thau, mark the limit of our personal experience. These rowing boats are most often seen stored idle with a kind of wooden ladder-like device resting across the top of them, between prow and stern, across the area where rowers would sit in order to row. Just occasionally, however, you might catch a glimpse of the boats with these strange ladder devices deployed as if ready for action. I’d have to say that seeing the ladders installed in this way doesn’t necessarily help to determine the craft’s real purpose. Here are a couple that we snapped, “ladders” at the ready, in Marseillan harbour. Given that much of the local action revolves around the sea, the fishing and oyster farming industries in particular, I think my first assumption was that these were some kind of peculiar fishing device. I’ve seen more oriental native fishing vessels deploying bright lights to attract fish at night. Could these be related in some way? No, the truth is much stranger. Imagine the court of King Arthur, dignitaries seated in galleries watching two armour clad knights, each carrying long lances and shields, mounted aboard heavy horses. The knights thunder towards each other astride their steeds attempting to unseat their opponent with the lance. Now, replace the heavy horses with rowing boats, move the knight, complete with his lance but without the heavy armour, up onto the strange ladder device and have the boats row towards each other in the harbour. The lancers attempt to tip each into the drink but do, I believe, attempt to avoid any Arthurian bloodshed. Now you have it – quite a colourful image. Unfortunately we’ve never actually seen these boats in action but it looks as though we just missed it in Mèze, judging by the grandstand that was erected on the harbour side.